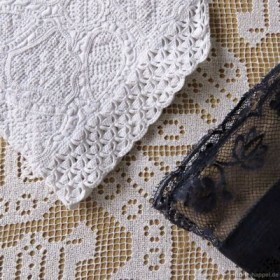 Schwalm whitework was often combined with lace. The most common was needlelace, but there were also other kinds of lace in the Schwalm. Sleeve cuff of a traditional Schwalm bodice decorated with needlelace, whitework, and a needleweaving hem. 1. 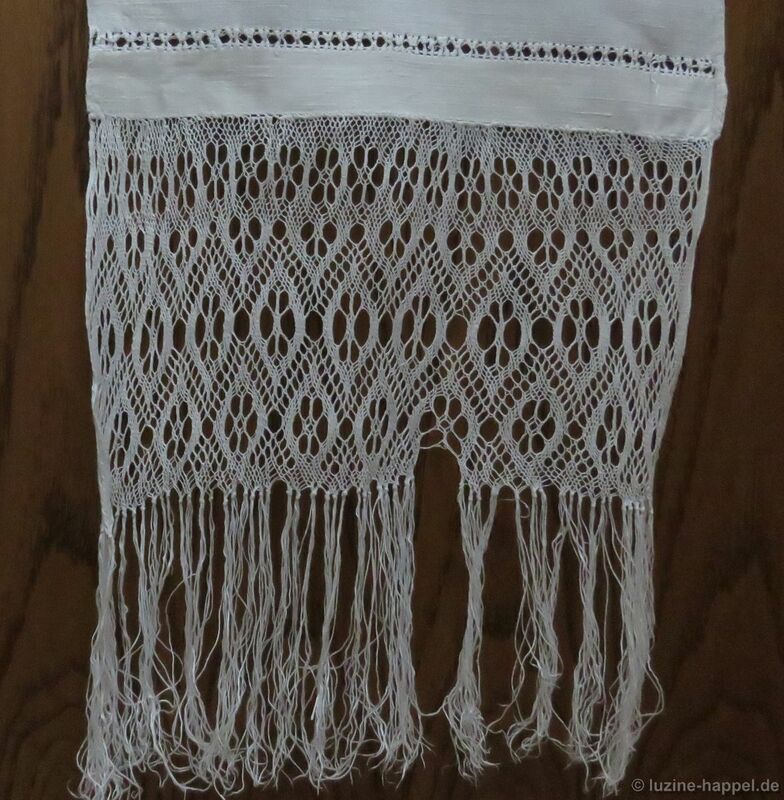 Needlelace was the most commonly used lace in the Schwalm. In combination with Schwalm whitework, it is found at the edges of bodice sleeve cuffs, at the front edges of dyed to black bodice jackets, at the upper edges of the waistbands of the white aprons, and at the collars, the cuffs, and the necks of men´s shirts. 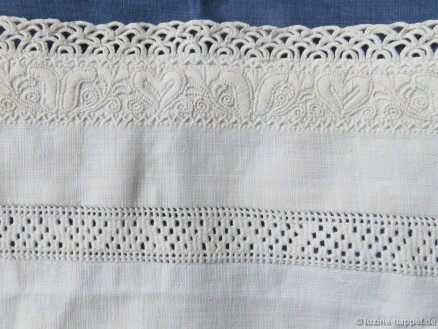 Needlelace was worked in a wide variety of different patterns. Needlelace was also worked with coloured thread to embellish garters and cap bands. 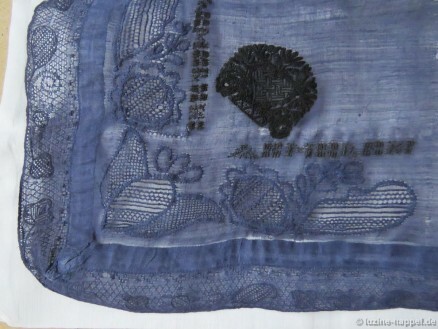 Sleeve cuff of a traditional dyed-to-blue Schwalm bodice decorated with bobbin lace, whitework, and Cross stitch initials. Traditional dyed-to-blue Schwalm decorative handkerchief with bobbin lace, whitework and Cross stitch crowns and initials. 2. 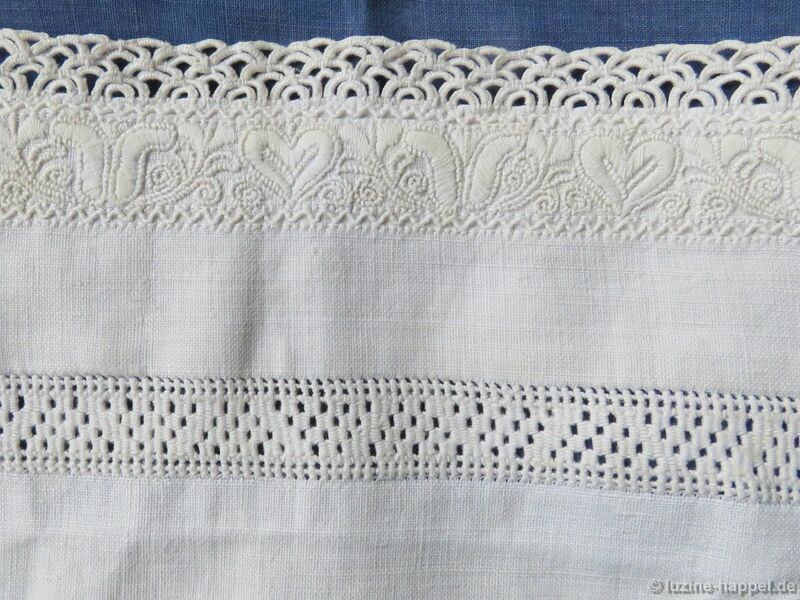 Bobbin lace, in combination with Schwalm whitework, is found at the sleeve cuffs of the blue bodices and at the edges of the dyed-to-blue decorative handkerchiefs. Bobbin lace is also found on bed coverings, door hangings, and at the front edges of the dyed-to-blue communion caps. It is also found on knitted baby caps. 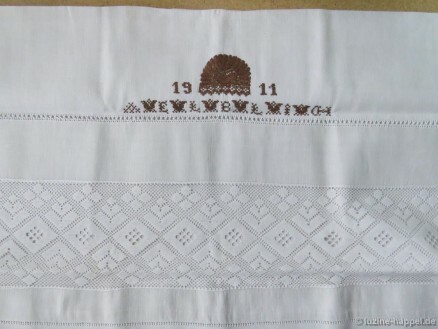 Parade cushion decorated with machine-made lace, Peahole hem and Four-Sided stitch hem, and a crown with the year and initials in Cross stitch. 3. 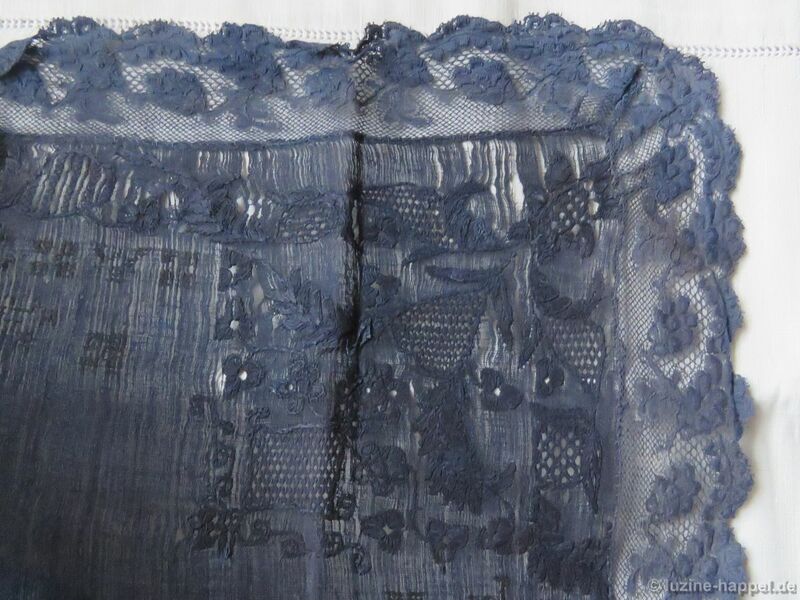 Machine-made lace is found on parade cushions, bed coverings, and door hangings. Most often it is used as an additional edge decoration in combination with Schwalm whitework. 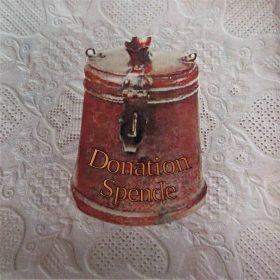 Sometimes it is used in combination with needle weaving hems and Schwalm crowns. 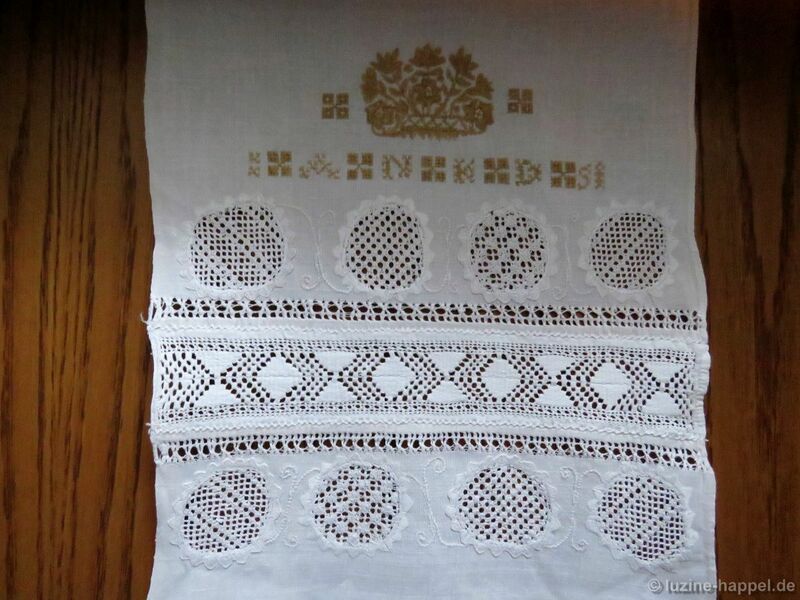 There are also examples of elaborate and pretty Schwalm whitework borders with machine-made lace as an insertion. 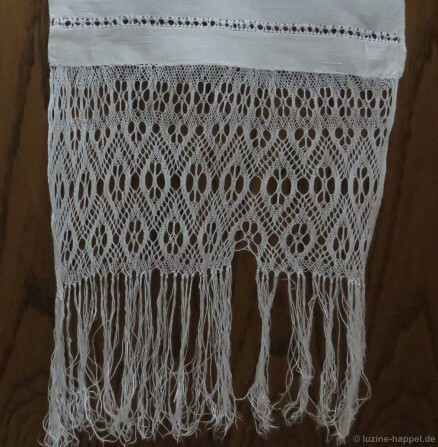 Two parts of a door hanging decorated with Schwalm whitework borders, Peahole hems, a needle weaving hem and sprang. 4. Sprang is found on bed coverings and door hangings. 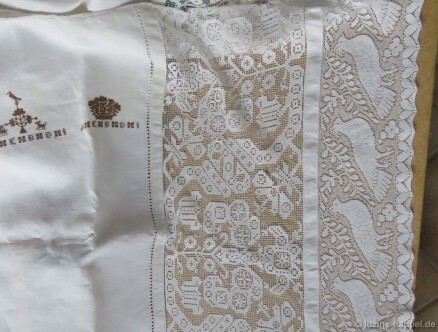 Bed covering with two different crowns with initials, filet, and a machine-made lace. 5. Filet is found on bed coverings and door hangings. 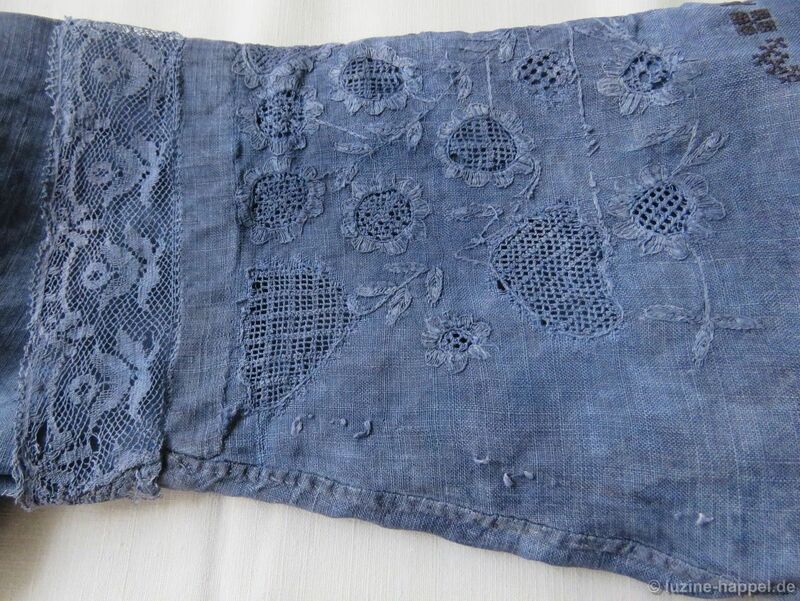 Very old decorative handkerchief dyed to blue. It is decorated with a Schwalm crown and initials worked with Cross stitches, whitework motifs, and a band with Dresden lace at two edges (and a small bobbin lace band at the remaining two edges – not shown in this picture). 6. Dresden lace was found on a decorative handkerchief. All of these will be subjects of more detailed articles in the future. Very interesting to see white embroidery dyed another colour. I wouldn’t want to take a chance with dyes after all the time and effort put into those embroideries. In the Schwalm they put a lot of time and effort into embroiederies and they dyed it to blue or to black after finishing. I have collected exquisite historical pieces. You can view some of them in future posts.